So whenever Beachbody comes out with a new program, I have to try it. Then I can decide if it’s for me, and if I want to recommend it to my friends and family. To date I have completed Hip Hop Abs, ChaLEAN Extreme, Les Mills Pump (twice), , INSANITY, Combat, The Ultimate Reset (twice), and now I’m doing PiYo. 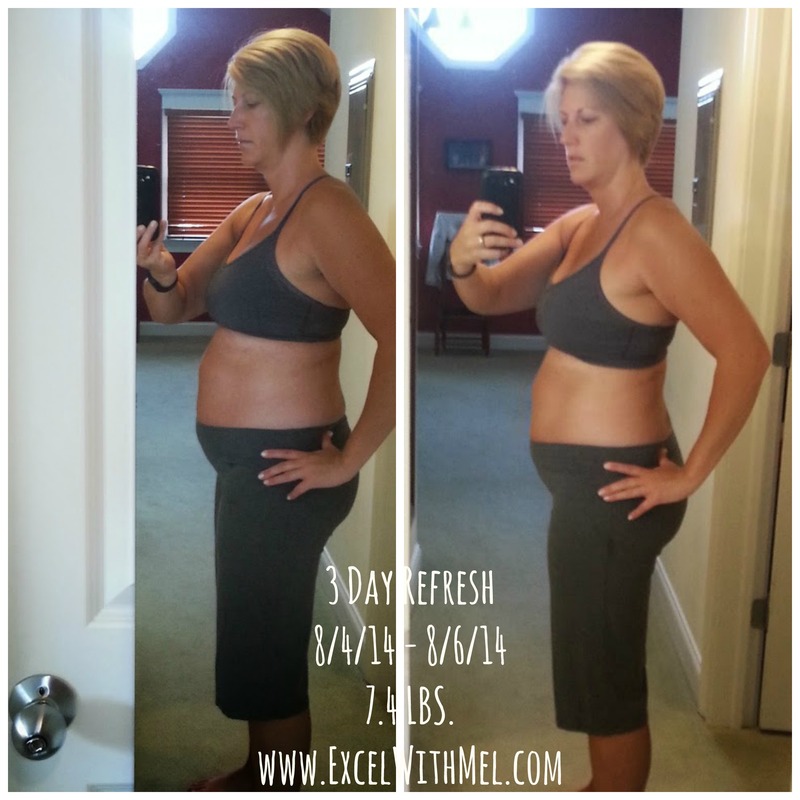 Sure I have recommended other programs to my challengers I haven’t completed yet – but I wanted to know what the 3 Day Refresh was really like. And as you can see, I had PHENOMENAL results…in just 3 days. But I didn’t want to post right after the program, you know – because everyone will say it’s a cleanse and you’ll just gain it back and it’s water weight…Well it’s 2 weeks later, and I still weigh the same as I did on the 4th day and I plan on doing this program again the first week of September…and again in October…and so on until I have reached my ultimate goal weight. I admit to over indulging far too often. I have a stressful job where I’m driving countless miles and visiting with clients all day every day. Then hubby and I like to enjoy our kid-free lifestyle so we go to dozens of Cubs game, nice dinners, concerts and festivals..all which come with their temptations. So this is what I am using to stay on track, and every month work to lose a few pounds of bloat that come on from my busy lifestyle. I DO workout 5-6 days a week, but it’s just not enough to combat the excess calories I consume, and this is a program that is easy to follow, and the 3 days are over before you know it. If you need a jump start on your weight loss to get on track for healthy eating, or if you need to break through a plateau, or even if you just need to lose those stubborn last 3-5 lbs., the 3 Day Refresh could be your answer. Order here today and we can do it together September 2-4, right after the Labor Day celebrations. Lost 4.6 lbs. in One Day!